Before being known as the ‘Blind Balladeer of Bacolod,’ Carl (Zaijian) had already fallen in love with music. At a young age, he knew that he had a great voice that dared him to dream to become a famous singer someday. However, it was not an easy road for him since any opportunity that knocked upon him fell short of his hopes. Unluckily, while trying to pursue a singing career, he got used by others for money. Subsequently, Carl began to lose his will to dream and succeed in singing. 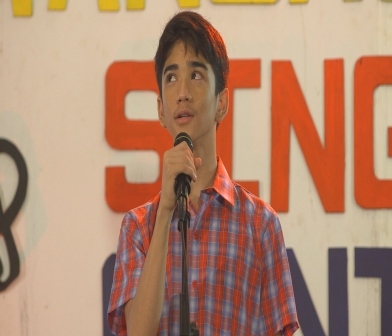 How did he regain his passion for singing that led him to the ‘Tawag ng Tanghalan’ stage? Joining this “MMK” episode are Victor Neri, Ana Roces, Maricel Morales, Lander Vera Cruz, Alex Diaz, Glenda Garcia, Joaquin Reyes, and Nathaniel Brit. The episode is directed by Garry Fernando and written by Joan Habana. “MMK” is led by Star Creatives COO Malou Santos. Don’t miss the longest-running drama anthology in Asia, “MMK”, every Saturday on ABS-CBN or ABS-CBN HD (SkyCable ch 167).